ALL REGIONS UK BLU-RAY RELEASE, PLAYABLE ON ALL US BLU-RAY PLAYERS. Please note that Disney Rewards are not available in the US (only in the UK). 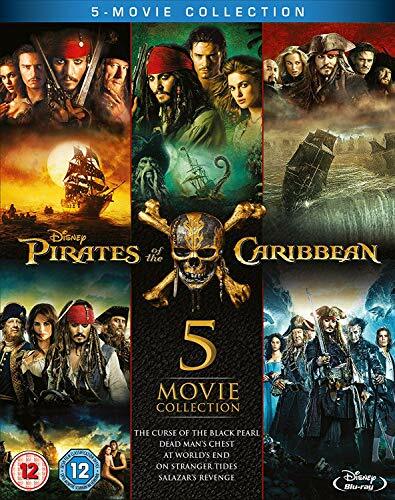 Pirates Of The Caribbean 1: The Curse Of The Black Pearl: Jack Sparrow and Will Turner brave the Caribbean Sea to stop a ship of pirates led by Captain Barbossa. Pirates Of The Caribbean 2: Dead Man's Chest: Captain Jack Sparrow is mortified to discover he owes a blood debt to the legendary Davey Jones, captain of the ghostly Flying Dutchman. Jack must find a way out of his debt or else be doomed to eternal damnation. Pirates Of The Caribbean 3: At World's End: We find our heroes in a desperate quest to free Captain Jack Sparrow from his mind-bending trap in Davy Jones' locker. They must forge their way to exotic Singapore and confront the cunning Chinese pirate Sao Fen. Pirates Of The Caribbean 4: On Stranger Tides: When Jack crosses paths with a woman from his past, he's not sure if it's love or if she's a ruthless con artist using him to find the fabled Fountain of Youth. When she forces him aboard the Queen Anne's Revenge, the ship of the formidable pirate Blackbeard, Jack finds himself on an unexpected adventure in which he doesn't know who to fear more: Blackbeard or the woman from his past. Pirates Of The Caribbean 5: Salazar's Revenge (Dead Men Tell No Tales): The rip-roaring adventure finds down-on-his-luck Captain Jack feeling the winds of ill-fortune blowing strongly his way when deadly ghost sailors, led by the terrifying Captain Salazar, escape from the Devil's Triangle bent on killing every pirate at sea-notably Jack. At the helm of the Dying Gull, his pitifully small and shabby ship, Captain Jack seeks not only to reverse his recent spate of ill fortune, but to save his very life from the most formidable and malicious foe he has ever faced.